WATER PRESSURE: I did not meter PSI but when I turned on the hydrant there was plenty of pressure. People complained that my signal was breaking up without the booster. I didn’t check because connectivity was good enough without it. 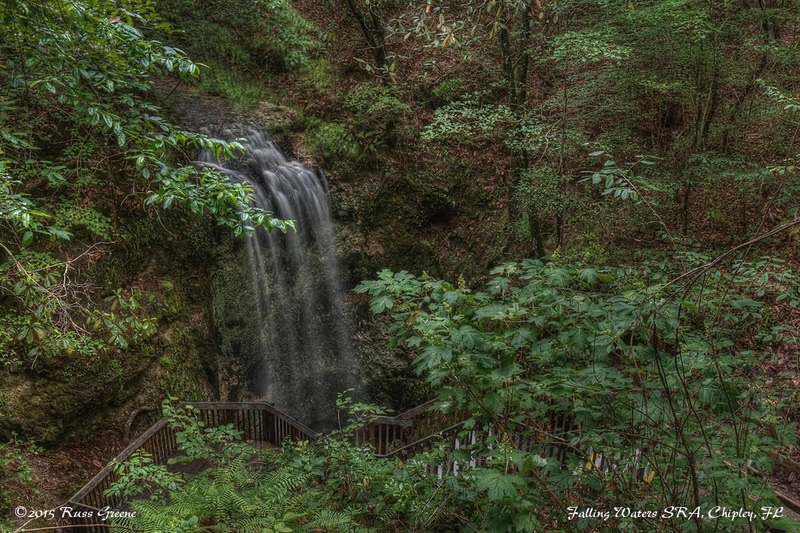 There is a little bit of hiking from Falling Waters campground. Some of it has wooden boardwalks to cross wet areas. 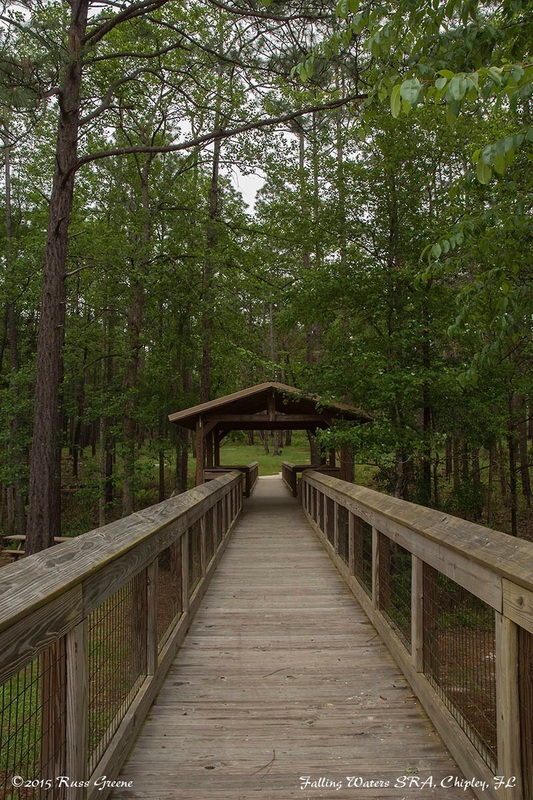 This section has a little covered bridge with benches to sit and enjoy the surroundings. SHOWER RATING: Pass (I evaluate showers in a similar fashion to restrooms. See above.) The shower I used had a curtain that was drawn into to shower by the air currents created when the shower was on and pressed itself against me. I find this incredibly annoying, the result of poor planning by people that really don’t care. Can you say, government? I gave a passing grade, reluctantly, because I noticed some little suction cups attached to the curtain which presumably can be used to mitigate this “curtain stick” and with a little fussing I was able to minimize the annoyance. BUGS: Not much activity when I was there in mid April. Smoke from a campfire clouds the air in this shot of Falling Waters State Park Campground/ It’s also referred to as a State Recreation Area (SRA). NEAREST FACILITIES: Chipley a few miles away should have most everything. There’s a Walmart SuperCenter there. Gas: Chipley, a few miles away. If you’re coming from up north in Alabama you may wish to fill up there. It was quite a bit less when I passed through. 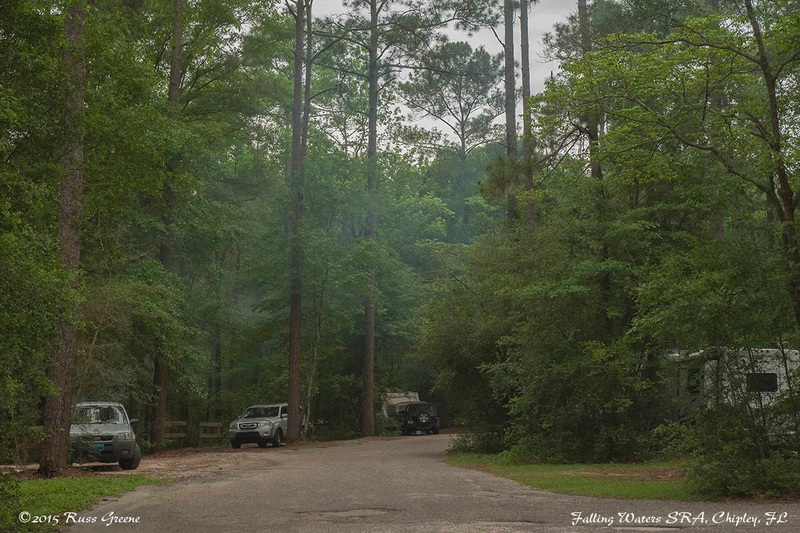 The campground at Falling Waters State Recreation Area (SRA) is set in a woodsy environment. The campground road is old but it’s fine. Let’s just say it has a little character. It’s narrow, however. 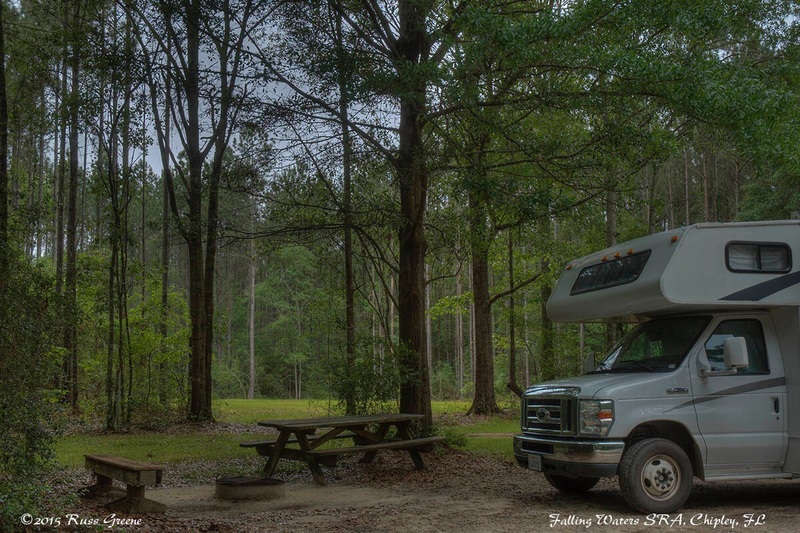 Except for the Accessible sites which have concrete pads the campsites themselves are sandy and in many you’ll be quite close to your neighbors. Some sites are too small for RVs. Others, according to data on ReserveAmerica can handle rigs to 45′. It feels a little closed-in here. The campground is nice enough, it’s lovely in fact, but having just come from Gunter Hill it was a little bit of a let down, but most places would be after having just been at Gunter Hill. 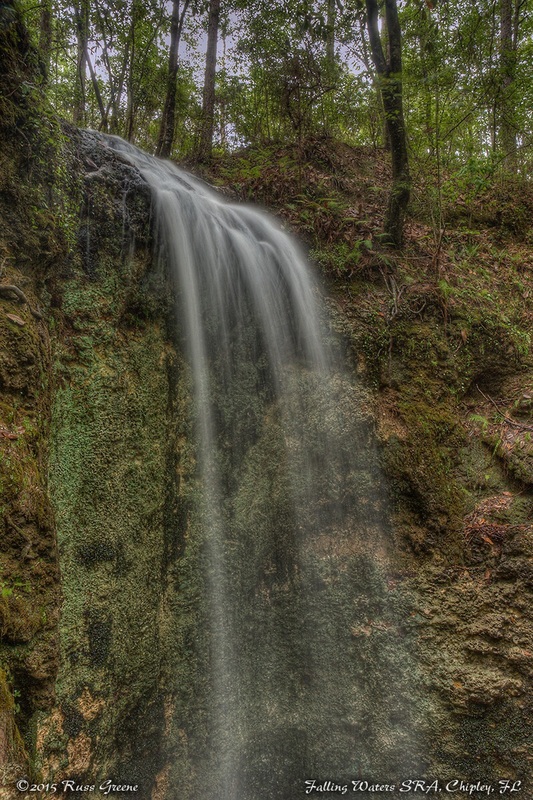 Literature for the park boasts Florida’s highest waterfall at 73′. Oddly, although the brochure for Falling Waters prominently features a photo of the waterfall on its front cover none of the campground maps I came across show it anywhere! When I walked the short hiking trail to the waterfall from the campground it seemed signs pointed to everything… everything that is except for the waterfall. Finally, when I was within 50 yards of the waterfall I came across a sign pointing the way. Government… sheesh. This shot shows part of the waterfall at Falling Waters. I’d call it a cute little waterfall. I’ve seen the falls at Yosemite, for example, which dwarf this little guy. During my short hike to the waterfall and back I came to the lake as it is referred to in the brochure. It seemed too small to call it a lake. I think pond would be more descriptive. A swimming area is roped off for those brave enough to use it–a sign next to the lake warns of alligators! Go for a dip? I’ll pass, thank you very much. I stayed at Falling Waters for a couple nights on my way from Montgomery Alabama to the Okefenokee Swamp in Georgia. There are more direct ways but I needed to get to Florida in order to check it off my 50 states list. Thanks for the candid and complete review – Great job! It’s a pretty place, really. I wouldn’t head there as a destination, unless perhaps I’d never seen a waterfall in my life 😉 It’s a fine place to stop over while passing through. And a great photograph! Hahah.